Last night I had an unexpected chat with our local supermarket delivery driver, which made me think about fear – and how much of our lives are affected by it. Steve, the driver called my boyfriend 10 mins before he arrived, to ask if he would go down to meet him on the ground floor. I asked why, and my boyfriend said “Oh because Steve can’t go in the lift, he’s terrified of them.” As we took the shopping from him, we were chatting and I began to ask him a bit more about his fear. He was incredibly open and explained that when he was ten-years-old he had been stuck in a lift for 3 hours, and had not stepped inside one since. He then told me that he had not been abroad since 1996, because he was scared of flying; even the Eurostar was not an option. He seemed pretty cool with spending the rest of his holidays in the UK, but it made me think how much his fear was limiting his life. As I said goodbye and shut the door, I was taken back to all the years when my life was limited because of the fear I had around food. It wasn’t just a case of avoiding food, I bypassed everything that meant I might have to consume food or drink. Steve said that he had explored lots of different options, but nothing had helped him, so he had come to terms with the reality of a life without travel. Although our experiences of fear are different, they are also similar in many ways. Although Steve’s fear is not life-threatening, his world is smaller as a result – just like mine was. I missed out on many occasions, and numerous connections with people because of my fear. The more I engaged in my fear, the bigger it grew, until it was paralysing to the point of almost death. But really, it wasn’t the fear of food or the fear of being fat that was the real problem. Sure, it might have started out like that, but the starving was just the weapon I found to fight off my feelings of inadequacy, low self-worth, fear of rejection and failure. I remember thinking that being thought of as ‘average’ would be the worst thing ever. I believed that to be worthy of love and acceptance I needed to be smarter, prettier and thinner than the next person. But in my quest to rid myself of every imperfection, I completely lost touch with my authentic self. I was in essence, fearful of me. The only way I could begin healing was by facing my fears slowly, and in a loving and caring environment that could hold me when it got too much to cope with. It was an active choice I made to broaden my world. I’d become so isolated from everything around me because of my fears, but I wanted more from life. I wanted more than my eating disorders desire to be the thinnest or prettiest. I wanted to be known for more than what I looked like on the outside. I redefined what success meant to me. I grew my self-esteem and let go of my ego. It wasn’t easy, and although I have talked about it not being about the food, my inner healing only began once I had faced some of the demons around the dinner table. I had to cry, get angry and let go of every fear that encased my body. I had to dive deep into the unknown. I had to prove to myself that it wasn’t about the apple pie or the pizza or even the extra drizzle of balsamic vinegar on my salad. It was about learning to feel at peace in my body and in my head. It’s a true story that the more you do something, the less power it has over you. The more I left my comfort zone, the less scary it became. The more I ate and engaged with food, the less power my ED voice had over me. This sense of confidence and strength slowly trickled in every other part of my life. I began to have a voice, I developed boundaries within relationships, and began to realise that my success didn’t need to be determined by what I had or what I did, but by what I felt. 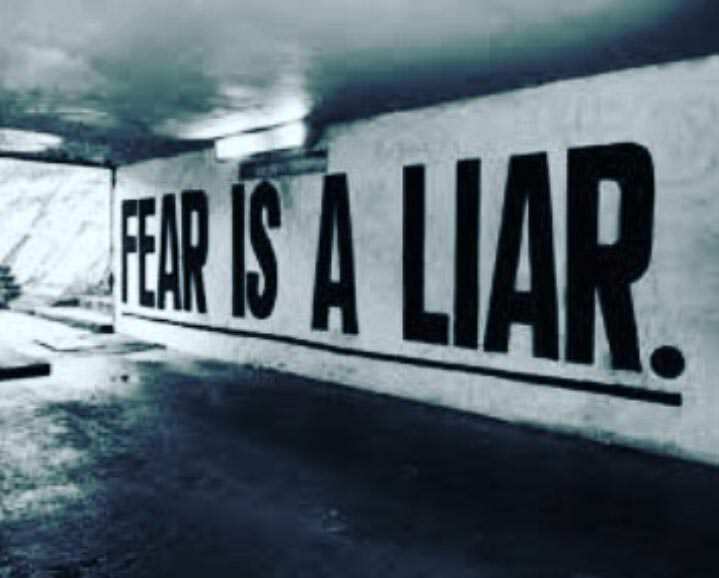 Fear can be incredibly disabling, but it can also be a valid emotion that can build character, resilience and courage. Feeling fear is human – it is ultimately there to protect you from harm, but my eating disorder had locked onto it and had made me fear life itself. Every time I conquer one of my fears now though, I feel a new sense of empowerment and pride. It is now rarely associated with overcoming a ‘fear food’ but is more about challenging the limitations and pressures I put on myself. So, for Steve, he has chosen to work within his fear of enclosed spaces, and he seems at peace with that. I encourage you to look at what is holding you back from being where you would like to be. Is there anywhere in your life where fear is limiting your world? If there is and you accept it, then that is totally OK, but if like me there is something holding you back that you want to change, then have a go a dipping your toe in the water. Every time you step into the unknown a little further you are building up valuable resources within.